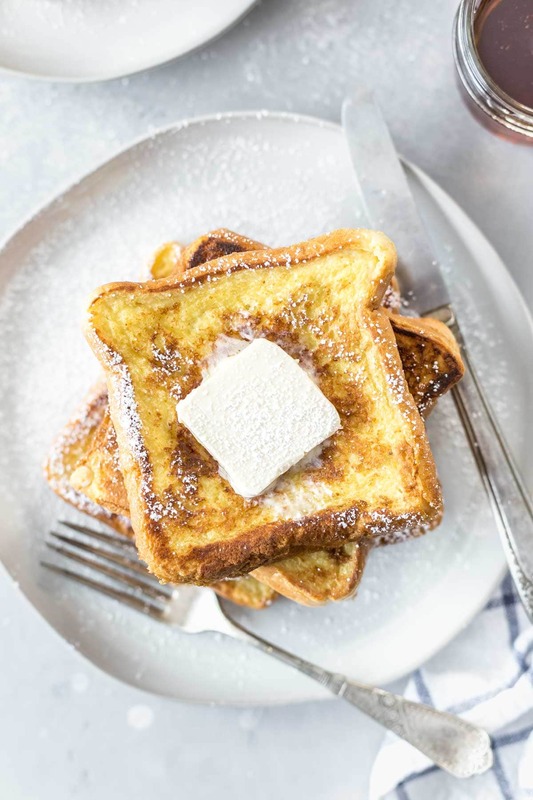 This easy, dairy free french toast recipe is made with your choice of dairy free milk and eggs. 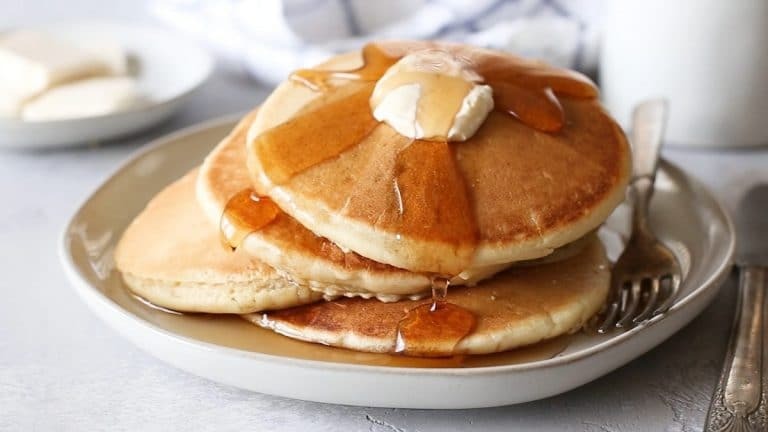 Top with maple syrup and vegan butter for a perfect weekend breakfast. Makes 12 slices or 6 servings. 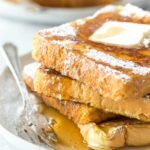 Can you make French toast with almond milk? 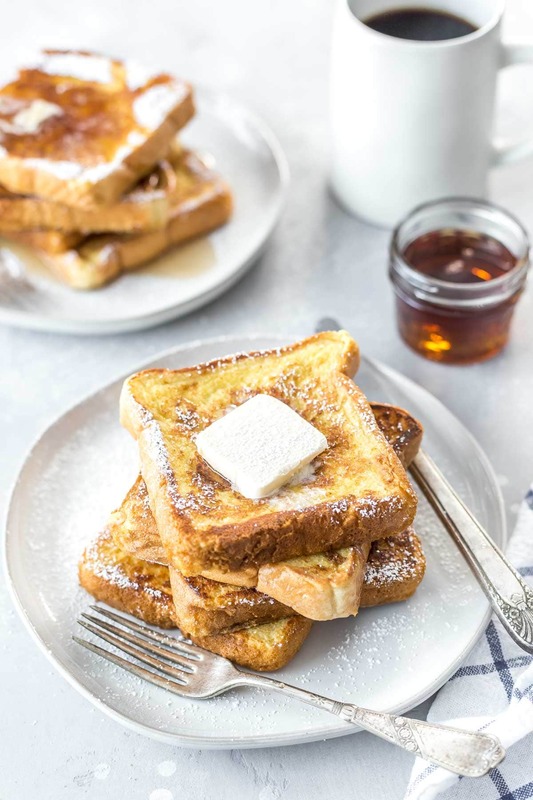 Since my extra fluffy dairy free pancakes have been such a hit, I figured it was time to show you how to make my other favorite sweet breakfast recipe: no milk French toast. It’s been a favorite of mine since I was a kid, and I had never actually made it myself until recently. Partially because I would get it at restaurants and partially because we never seemed to have the right kind of bread in the pantry. When my in-laws were visiting recently, we decided to try out a dairy free version of French toast and it turned out just right, so I obviously had to do a little more testing to make sure it was perfect before sharing the recipe. So, what can you use in French toast instead of milk? It totally depends on what you have at home, but I prefer to use cashew or almond milk. You could also use soy, light coconut milk or any plant based milk you prefer. The thing that really makes this no milk French toast recipe work is the eggs. You can’t get a good custard base without the eggs (although you could potentially sub a flax or chia egg if you want to make this vegan). 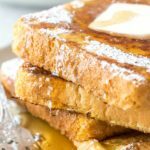 Want to make vegan French toast instead? Try using a chia or flax egg. If you want to make this gluten free, try some gluten free Texas toast. Avoiding refined sugar? Try honey or maple syrup instead of sugar. Pick the right bread. You want a nice thick slice of bread that won’t soak up too much liquid. I prefer a nice thick Texas toast, but you can use whatever bread you like. 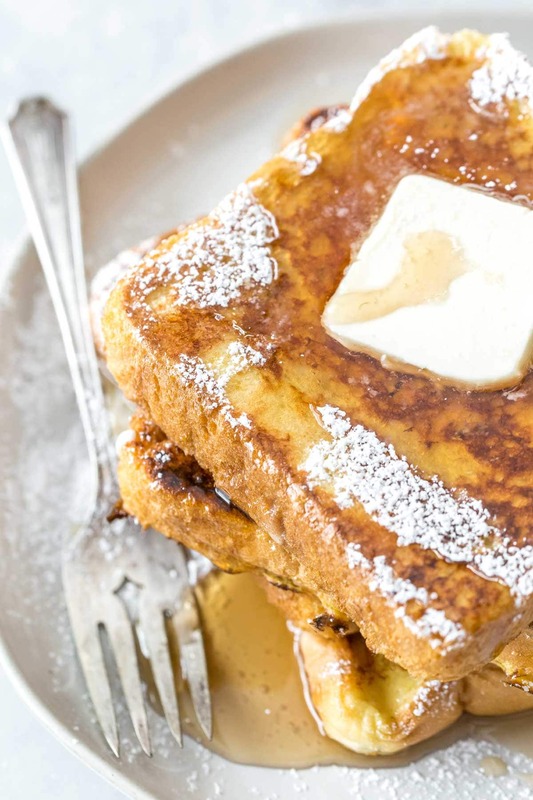 Just make sure that your bread isn’t too thin or you’ll end up with soggy, sad French toast. Mix your egg-milk soak. In a large mixing bowl, whisk your milk, eggs, vanilla extract and salt until smooth. You will be dipping your bread in this until it’s evenly coated, but do each slice right before cooking. Don’t let any of the bread sit around soaking in it. You could also add a sprinkle of cinnamon or nutmeg here, too. Toast your soaked bread. Heat a large skillet or griddle (bonus points for a double griddle) to medium. 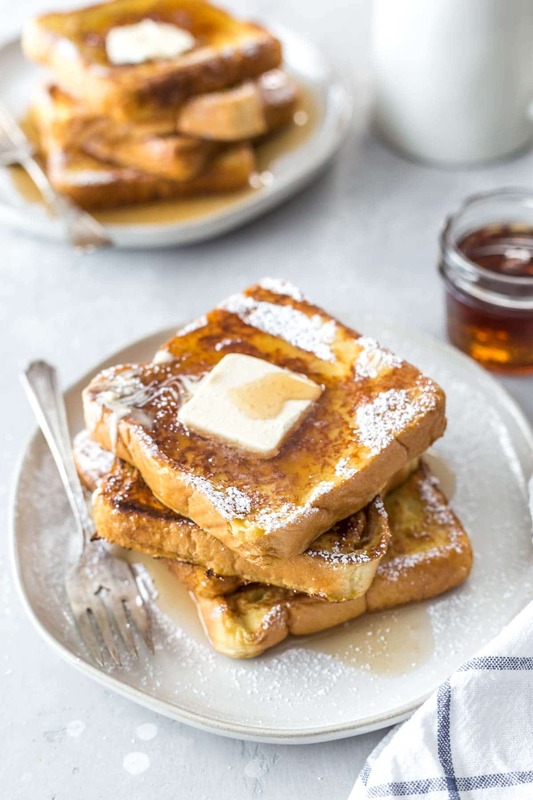 Cook your French toast until each side is golden brown. Bake it in the oven (optional). Transfer your French toast slices to a cookie sheet and bake them for about 10 minutes in a 400˚F oven. If you want to know more about why you would want to take the time to do this optional step, read the paragraph below. Why is my French toast soggy in the middle? Don’t over soak your bread. Make sure you only leave your bread in the egg-milk soak long enough to coat it. Don’t let it sit in there while you wait for the pan to be ready. This should be a quick 1 – 2 second soak and that’s it. Use thicker bread. 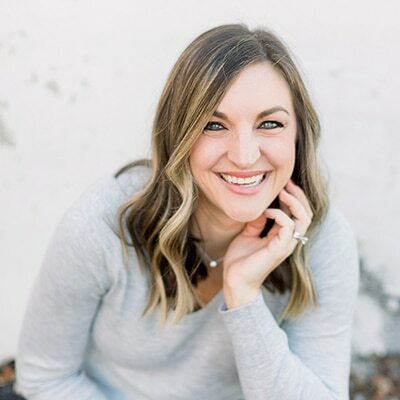 I prefer to use a Texas style toast because it’s the thickest I can find that’s also dairy free, but you could easily choose a loaf that you could slice yourself and give yourself the extra thickness. 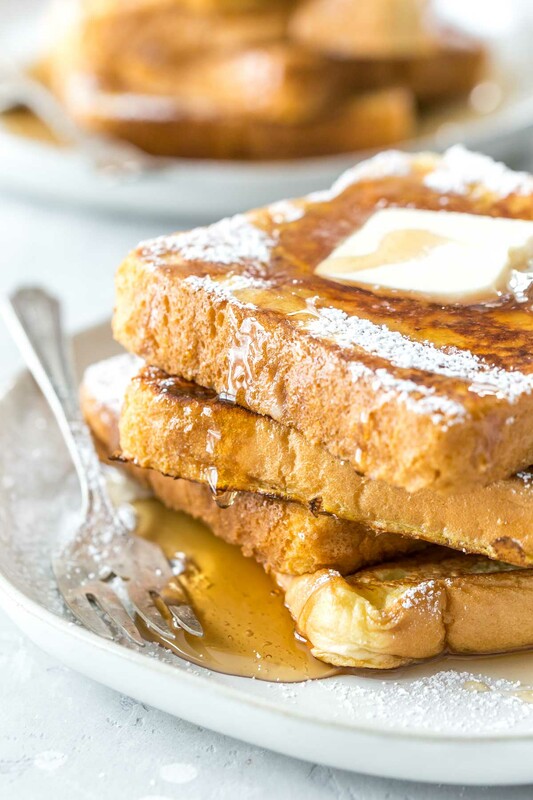 Bake your French toast after cooking it on the griddle. Place the cooked dairy free French toast on a cookie sheet and bake for about 15 minutes at 400˚F. This is totally optional, but it will ensure that your dairy free French toast isn’t soggy and everything will be the same temperature when serving. I don’t normally bother wit this step, but you’re serving guests or make to ensure you don’t have soggy centers, this step is a must. In a large bowl, whisk together the dairy free milk, eggs, vanilla extract and coarse salt. Heat a large griddle or non-stick skillet to medium. Dip each slice of toast into the egg mixture until both sides are evenly coated (about 1 – 2 seconds per side). Cook each side of the bread until golden-brown. Repeat until all slices have been cooked. Optional: Preheat oven to 400˚F. After cooking each slice transfer to a baking sheet and toast all pieces in the oven for about 10 minutes.